Ronnie was born wild in Asia in 1966. Like so many other circus elephants, she was captured at a young age, separated from her family, and shipped to the United States to perform in the circus. Little is known about her early years, but records indicate that in 1975, at the age of nine, Ronnie was purchased by the Hawthorn Corporation, a company that trained and leased elephants to circuses. Ronnie spent the next three decades performing. When not performing, Ronnie and the other Hawthorn elephants would be housed in a dark barn, chained in place for much of the day. In 1993, Ronnie gave birth to a male calf named Nicholas who also performed in Hawthorn circuses. 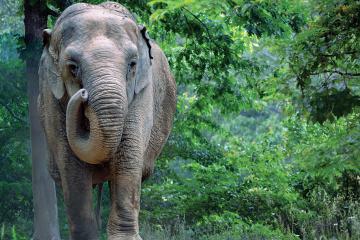 As a result of USDA prosecutions against the Hawthorn Corporation for violations of the Animal Welfare Act involving inadequate care and mistreatment of its elephants, Ronnie was transferred to The Elephant Sanctuary in Tennessee. On February 7, 2006, Ronnie became The Sanctuary’s 20th resident, traveling with her closest companion, Debbie. 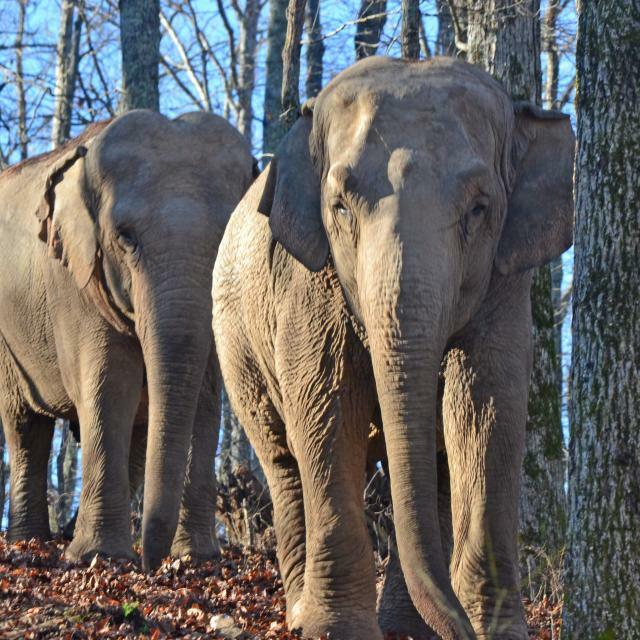 They were the fifth and sixth of eight circus elephants to travel from Illinois to Tennessee in 2006. Lottie, Minnie, Queenie, and Liz preceded them in arrival. Billie and Frieda followed on February 9, 2006. Nicholas was transferred to the Performing Animal Welfare Society (PAWS) in California in the spring of 2007. Ronnie and Debbie are constant companions. They explore their habitat daily, Ronnie often seeming to take the lead. They spend a lot of time in the woods that border Q Habitat’s meadows. Ronnie is very food-motivated, despite her small stature and status as the smallest Asian elephant at The Sanctuary. She is very animated and seems to enjoy playing in the ponds and mud wallows, and exploring new areas of the habitat. Ronnie is often referred to as the “tie that binds” the Q Habitat Herd together. In addition to spending time with Debbie, Ronnie also has frequent “play-dates” with Minnie and was the first elephant to share space with Sissy upon Sissy’s move to Q Habitat in 2017. Care Staff enjoy watching the developing relationship between Billie and Ronnie, who have begun to share space and have been observed touching each other’s faces, trunks, and feet and enjoying snacks together.